Gov. Roy Cooper asked a court late Friday to either kill a subpoena from the legislature that requires Larry Hall to testify at a confirmation hearing or modify the date on the document. Hall is Cooper’s pick to head the state Department of Military and Veteran Affairs, and he is currently serving in that capacity. He was subpoenaed by a Senate committee Thursday after not showing up for his third scheduled confirmation hearing. Gov. Cooper and his cabinet pick Larry Hall. 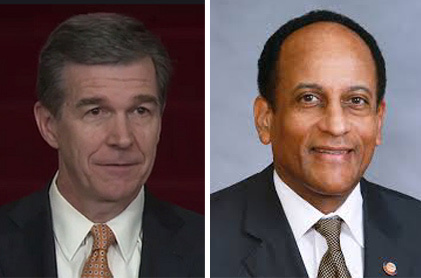 A three-judge panel recently found that Cooper is to initiate the Senate’s advice and consent process by formally notifying the body’s president of his appointees. He has until May 15 to do so. Cooper states in the Friday court filing that he wants to wait for the court’s decision on whether the confirmation hearings are constitutional before his appointees testify. The trial is March 7. He also argues that the subpoena is procedurally defective because it was issued for a matter “not properly before the court,” which is required by the North Carolina statute that gives the legislature subpoena powers. If the court doesn’t completely kill the subpoena, Cooper has asked that the date be modified so that Hall doesn’t have to testify until after the trial. Senate President Pro Tem Phil Berger responded that he believes Cooper is asking the court to help him hide his nominees’ conflicts of interest — which seems to indicate what the legislature intends to go after in these hearings. It should be noted that the law allows Cooper’s appointees to serve in interim capacities (and collect paychecks for the work they perform) until the Senate process begins and ends. It should also be noted that it was the legislature’s law, passed hastily at a special session, that requires a formal nomination process from Cooper. Some Democrats said at the Thursday confirmation hearing that Republicans were facing the consequences of their own law, which was not written well enough for this scenario.